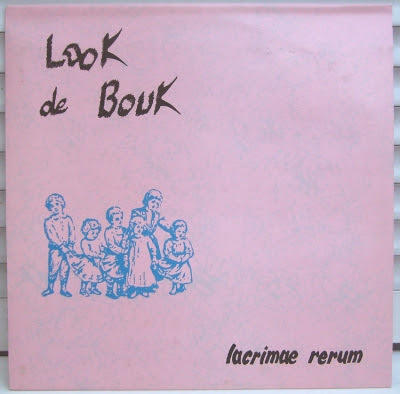 MUTANT SOUNDS: Look de Bouk-Lacrimae rerum,LP,1985,France. Denis Tagu, once a member of Hellebore, picked up bunch of musicians after the Hellebore's split (though I suspect that the former Hellebore members just assumed funny pseudonyms and continue to work in a realm of weird music for at least a few years (and more, for the linear notes promise band's ressurection in years to come, and thus 2003 being one of these years)). Lacrimae Rerum(L'Acre Hymne Aerait Rome) being listened to from a distance sounds like head on collision of 80's Residents and Barricade 3 era ZNR, at a closer "Look" listener recognizes a swarming mass of unexpected sonic combinations. More wavy than Hellebore (sometimes even discoid, and thus more in the spirit of the age). Pascal Comelade-like toy-sounds mingle with "serious" ones, say ZNR-ic or better said Satiesque keyboard passage, oozing out a myriad of eccentricities. Placed on the line of humor, but on quite the opposite side of [Hellebore's] Il y a des Jours, "Tout Comme Bach" is perhaps the finest example. Pretty good and highly recommended. Bec et Ongles is weirder in construction, looser and more playful, yet it sounds quite "normal". Playful to the degree of being thoroughly childish and containing 24 short tracks, it comes even closer to Klimperei, Pascal Comelade and other French "toylovers". The main point of this offering is not to concentrate on presentation of odd combinations but to present the everlastingness of the young spirits in general and their youth in particular. So the results are plainly charming and not mind-disturbing. It must be noted, though, that the work was accomplished with the help of L'Ensemble Raye members and associates (such as Brode Tango) in whose studio in Switzerland Bec et Ongles was recorded. The "unity" of the actors involved may help to grasp the further shift from brooding experimentation of early Hellebore days to childish ear friendliness of Look's Bec. The material thus sounds somewhat similar to Ensemble Raye efforts, but still, these may be light years away. Indispensable for any avant-prog collector. Awesome 1st LP released through AYAA label ,with contribution of Patrick Q. Wright of Legendary Pink Dots fame.A magic record....RIO experimentation at it's best. Thank you so much for this, a fabulous lost album. I think it's improper to imply, as you do, that Look de Bouk was started by Denis Tagu picking up a bunch of musicians. From what I know, having lived in the same town as the band at the time and knowing some of its members, the initial driving force of the band was actually Etienne Himalaya (ex-Germain Hubert Ales, also the driving force of AAA, later AYAA and the Notes Magazine) with Kwettap Ieuw (later also in Toupidek Limonade) and Denis Tagu. as I'm myself Etienne Himalaya, i can say without any doubt that LDB started in 1982 with Kwettap Ieuw, Martial Canterel and myself. Denis joined the group few years later. I REALLY delighted to find you commenting here and know that your happy with our post of your work!